Light oil air injection is basically just another immiscible gas injection process that is used to maintain reservoir pressure and improve oil recovery. There are large volumes of low viscosity oil in deeper, hotter reservoirs where high pressure air injection can recover like this if CO2 is not available. It should only be used where lower-viscosity, lower-density gas will not override the oil. Because the gas is being used at high pressure a significant fraction of the flue gas can dissolve in the oil and the flue-gas could even be miscible with a very light oil. 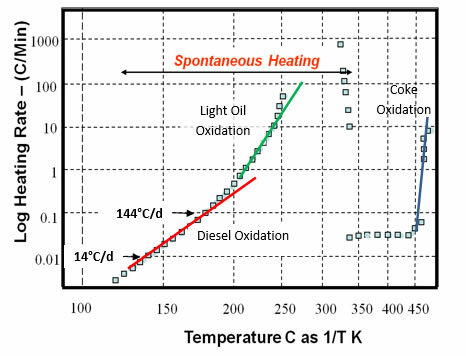 The following figure presents ignition temperatures of hydrocarbons. 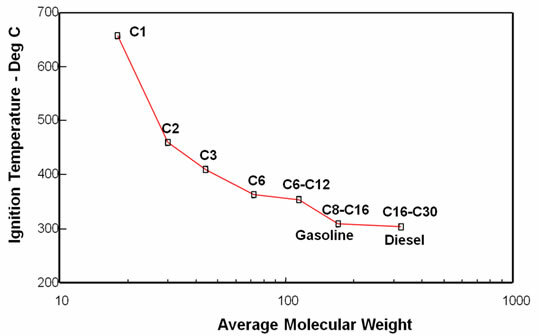 The figure shows that the diesel fraction of the oil is much more flammable than lower molecular weight fractions. This figure means that light oils will ignite relatively easily. Two types of combustion tests are needed to design a HPAI (or LOAI) project. These are an Accelerating Rate Calorimeter (ARC) and a combustion tube. An ARC cell shown in the following figure is just a small (10cc) high-pressure vessel filled with rock, oil, water and pressurized with air or another gas to reservoir pressure. Most of these cells are designed for pressures of 40,000 to 70,000 kPa. The cell is placed in a adiabatic oven inside a pressure vessel shown in the adjacent figure. Then the cell is heated in steps of 5°C. At the end of each heating step, the sample is held at that temperature for a few minutes. Soon the sample begins to spontaneously heat. When the heating rate exceeds 0.002°C per minute (2.88°C) per day, the step heater is turned off and the adiabatic heater control maintains the enclosures temperature at the temperature of the ARC cell. The next figure shows typical results of an ARC test. 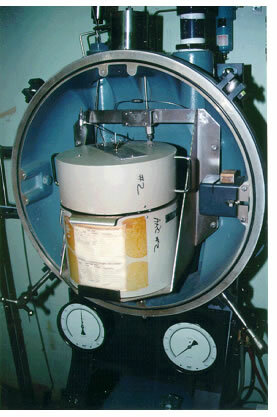 The sample is heated to approximately 100°C, than is allowed to heat spontaneously. After a few days, the sample has reached 130°C and the heating rate has accelerated to 14°C/day. Shortly over a day later, the self heating rate has reached 144°C/day. A few hours later the self heating rate has reached 1,000°C/min. When the diesel fraction of the oil has been consumed, the heating rate subsides to around 50°C/day. If the heating is allowed to continue, the temperatures enter the range shown elsewhere where the heavy components of the oil begin to pyrolyze. The coke that forms then begins to burn and the rate of temperature increase accelerates again. The heating rate in an ARC test, is really a plot of oxidation rate (energy released) versus 1/T°K, i.e., an Arrhenius plot. This means that the activation energy of the oxidation reactions can be calculated from the slopes of the plot. So, three straight lines have been drawn through the data to represent, diesel oxidation (red), light oil burning (green) and coke oxidation (blue). The oxidation of coke has the highest slope so it has the highest activation energy. Likewise, the initial oxidation reaction has a lower activation energy because it has a low slope. Thus an ARC test yields the basic kinetic data that can be verified later in simulations of combustion tubes and used in field projects. A combustion tube is the other experiment which should be conducted in order to understand the combustion process. Like the ARC test a combustion tube should be an adiabatic experiment. The next shows a combustion tube at the University of Calgary that is rated for 42 MPa. The heated portion of the tube is 1.5 meters long and the temperature of the shell is maintained at the temperature recorded in the core by 12 individual band heaters and twelve interior thermocouples. The core holder is mounted vertically. The core holder is first filled with crushed rock and water. Then it is flooded with oil and flushed with nitrogen to prevent pressure build when ignitied. The experiment is started by heating the first zone to a temperature where ignition rapidly occurs, such as 150°C while the remainder of the tube is maintained at reservoir temperature and pressure. Finally, air injection begins and ignition occurs. 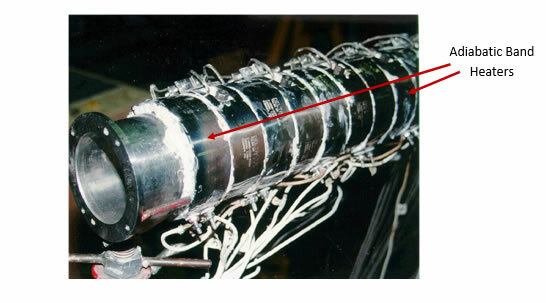 The air injection rate may be changed during the experiment. 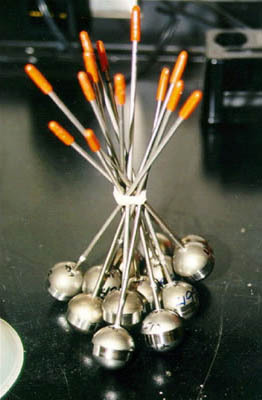 The temperature, fluid production and gas composition are monitored during the experiment and modeled later. The air injection is stopped when the combustion front has passed through about 80 percent of the core. Production and temperature are modeled to confirm reaction kinetics, learn about high temperature phase behavior and confirm the energy released in combustion. It is very important that the combustion tube be adiabatic for this to be done easily because 75 percent of the energy released by combustion can easily be lost to the shell, insulation and surroundings if the temperatures in the zones are not independently controlled. 42 MPa, 1.5 Meter Combustion Tube with Twelve Heater Sections. The results of modeling these experiments are accurate reaction stoichiometry, accurate reaction kinetic parameters that produce the observed components, K values of the components at high temperatures and a model of combustion that often can be used directly in a reservoir model. The only change that might have to take place is to compensate for the large grid blocks in a reservoir model and small combustion zone by lowering the activation energy of the oxidation reactions so that they occur at the lower average temperature of a reservoir grid block. However, even that is not generally necessary.